Explosive. If you look up the word in the dictionary, you should see Tavon Austin’s picture beside it. When the ball is in his hands, he’s a treat to watch. Tavon Austin led the country in all-purpose yards in 2011 and was 2nd this last year. He had 111 catches for 1,287 yards and 12 touchdowns in 2012. Austin also averaged 11.0 yards per punt return and 25.41 per kickoff return and had 2 return touchdowns. The best example of his amazing ability was against Oklahoma. In that game, he lined up at running back and receiver and had 572 all-purpose yards and 344 rushing yards and 2 touchdowns. He is truly a player that is a threat to go all the way every time the ball is in his hands. Tavon Austin is a player you have to find a way to get the ball in his hands. He showed his speed at the NFL Combine by running a 4.34 40 which was second only to Olympic long jumper Marquise Goodwin. Not only does Austin have elite speed, but he has a sudden stop/start quickness and instant acceleration. When Austin gets in space he has a second gear that allows him separate from defenders very quickly. Once he gets the ball, he uses stutter steps, juke moves and can start and stop on a dime which makes him difficult to tackle. Maybe the best part about him is his winning smile. He has a joy for the game that exudes from him and elevates the play of the players around him. I have had Austin ranked as my top receiver since the NFL Combine. Other draft analysts are now starting to follow suit. Mike Mayock, Mel Kiper Jr. and Todd McShay have all recently moved him to their top wide receiver. He may have more buzz around him going into the NFL Draft than any other player. The biggest question going into the draft is his size. At 5’ 8” and 174 lbs. many people question the selection of Austin as a high pick in the first round. Austin will be a slot receiver at the next level and most teams do not want to spend that much money on a slot receiver. Normally those types of players are found later in the draft. Austin, however, is one of those rare talents that will make teams re-think that strategy. Most people question whether he can take a beating at the NFL level; however, he is about the same size as DeSean Jackson of the Eagles. Despite his size, he is a fearless player. The ability to return both punts and kickoffs will also have to be factored into the decision. The St. Louis Rams have two picks in the 1st round, the first of which is pick 16. They lost their leading receiver, Danny Amendola to the New England Patriots. Amendola was also a slot receiver. If Austin is still available at pick 16, I don’t see any way the Rams pass on him. Sam Bradford needs weapons, so why not go get him the best weapon in the draft? 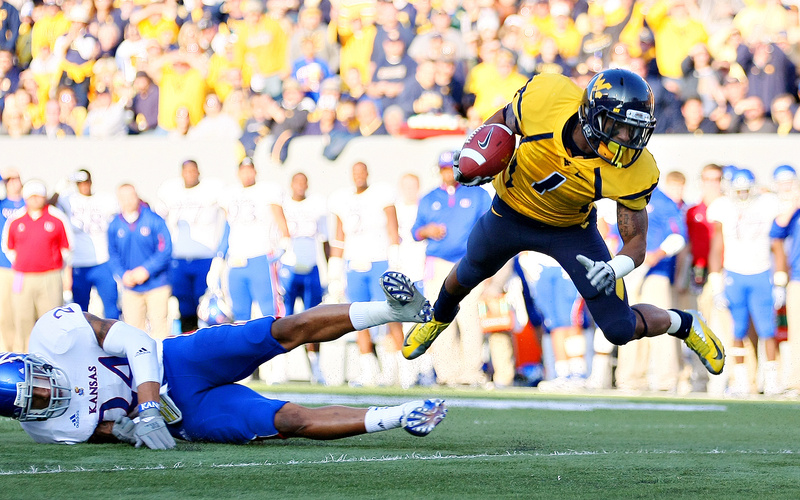 One thing is certain; Tavon Austin is the most exciting player available for this draft. The fun part will be watching to see if NFL defenses can catch up to him. This entry was posted on April 21, 2013 by draftmaniacs in Draft profiles and tagged 2013 NFL Combine, 2013 NFL Draft, 2013 NFLDraft, NFL, NFL Draft, Tavon Austin, west virginia football.